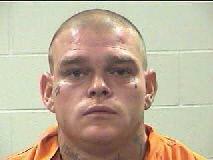 Career Criminal Gets Life for Firearms Violation, LIVINGSTON, March 8, 2014 - On Friday, March 7th 2014, Phillip Farrell was found guilty of possession of a firearm by a felon by a Polk County jury and was sentenced to Life in prison based on his extensive criminal history. On August 5th of 2013 Richard Gagnon, Adam Horn, and Katrina Barnes had delivered a .22 rifle to Mr. Farrell in exchange for drugs. The rifle was stolen in a burglary of a habitation in Polk County that same day. Prosecutor Brian Foley explained to the jury that Mr. Farrell was not only a long time convict but also an admitted member of the Texas prison gang known as “Tango Blast” specifically a “Houstone.” Mr. Farrell took the witness stand in his defense and admitted that he had been arrested or convicted 34 times and never continuously lived in the free world for more than 6 months since his criminal record began in 1998. Mr. Farrell told jurors that he had a good heart and never did anybody any harm. On cross examination however Mr. Farrell made a veiled threat to the officers involved and their families when questioned on his prior conviction of Assault and Robbery involving a theft where Mr. Farrell pulled a knife. District Attorney Lee Hon said that he was appreciative of the hard work and thoughtful consideration taken by the jury. He also wanted to thank Prosecutor Brian Foley for his hard work in the case.